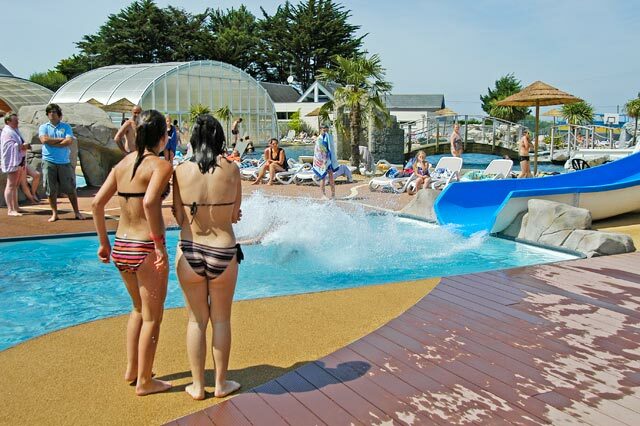 Close your eyes and imagine a piece of paradise on earth, between Brittany and Vendée close to the sea. 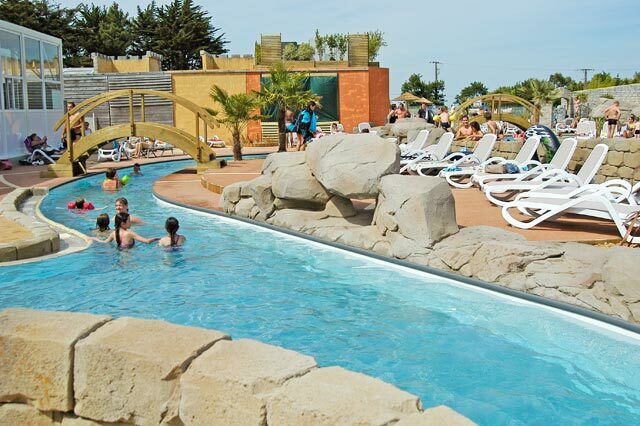 Put your foot in the most breathtaking aquatic complex of all the Loire Atlantique. 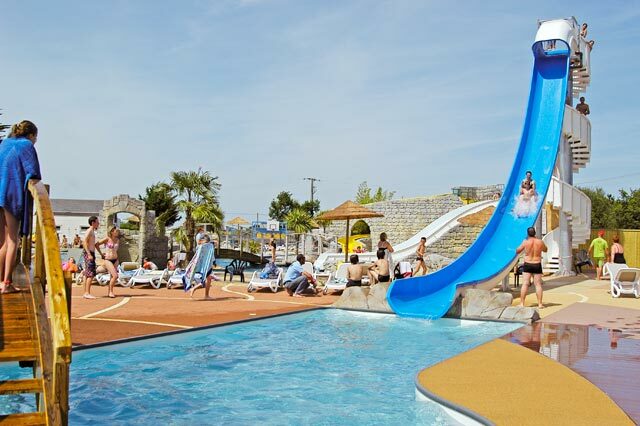 Your 4-star family campsite puts at your disposal its magnificent aqua-fun park where young and old meet for family dream holidays or between friends. The city of Guérande is one of the few cities in France to have kept all of its 1500 meters of ramparts. 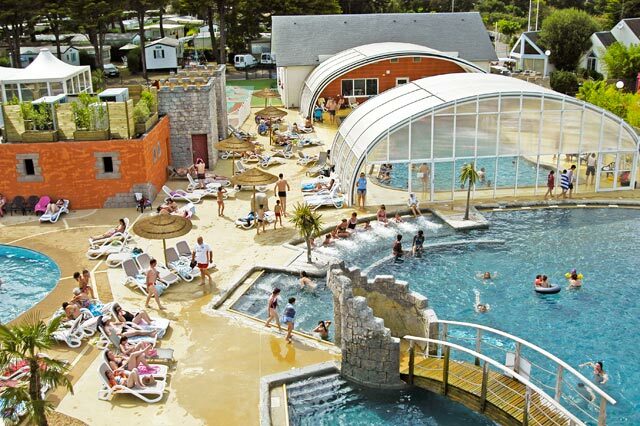 It is on this architectural theme, in a nod to our beautiful medieval city , that the Domaine de Léveno Camping Club has designed its new aquatic area. near its magnificent heated pools , assemblages of old stones imitating granite masonry, present on the old buildings of the city. 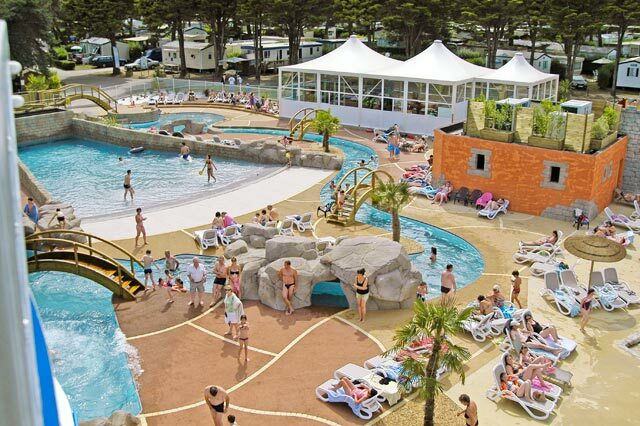 The heated indoor pool is open from April to September throughout the opening period of the campsite. The outdoor complex is open from mid-May to mid-September. 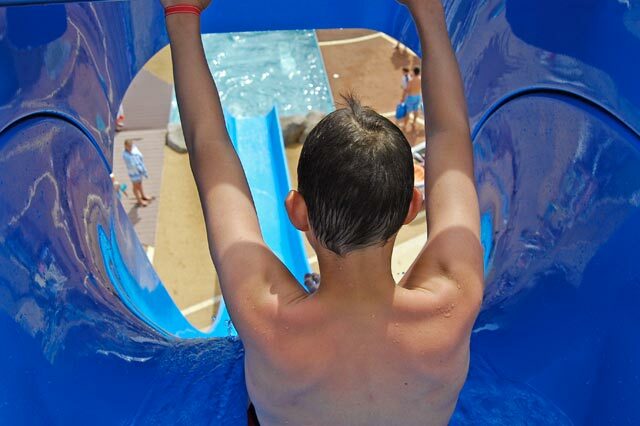 The entire water park features heated pools during open times. 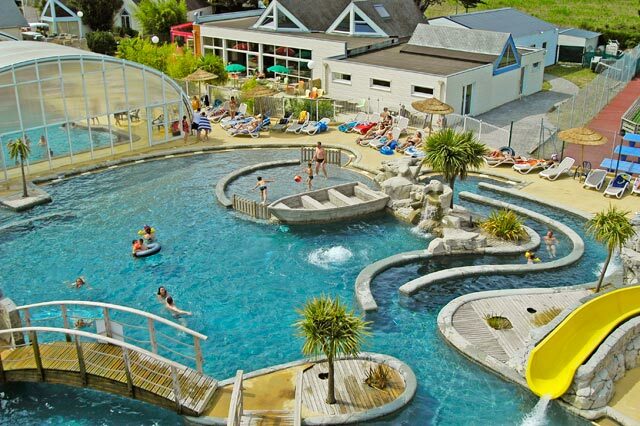 The indoor pool is heated from the date of opening of the holiday village in April. So, as early as the Easter holidays , be certain to find a water at good temperature, dominated by a transparent dome that protects you in case of rain. 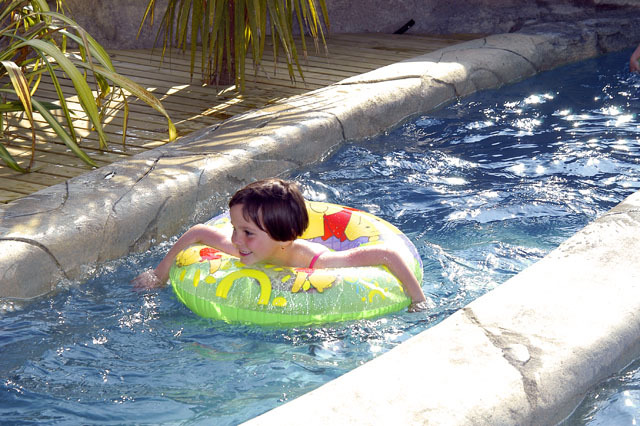 If the pool water is heated , do not worry about leaving the pool! The ambient air is too. When spring comes, the dome is retractable and opens to let in fresh air and sunshine. Thanks to this infrastructure, you can enjoy the joys of swimming in all seasons. For your young children, an indoor paddling pool equipped with a toboggan adapted welcomes you. Nobody gets tired of the innumerable virtues of the hammam , appreciated and used originally by the Romans, and especially by their armies, for a physical and muscular recovery more efficient. Experience a moment of relaxation and well-being in the hammam of the campsite . Its use is free during the whole opening period, even during the long holidays. The hammam is accessible from the holidays of April. The outdoor party is the most amazing in the water park. 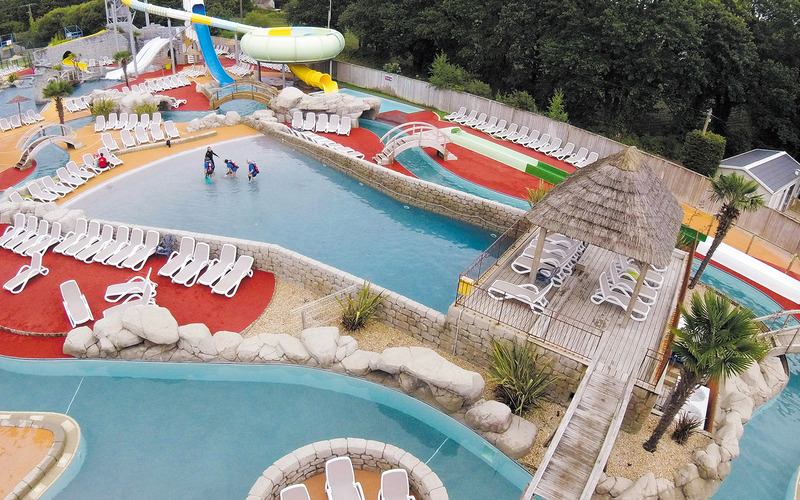 Navigate between swimming, sluggish river, fast running and water games, water slides and wave pool ... A unique experience to share with the whole family , the middle of the Guerande mountains and a rich color scheme. Bring your loved ones and enjoy the tranquility of a world evoking good humor, sharing and conviviality. Relax on the various sun loungers and deckchairs available all around the different worlds of the pool complex, and enjoy the spirit of farnient holidays at the sweetness of the ’summer. For even more pleasure, and always in a spirit of intense relaxation, anatomical and hydro-massage benches are installed. 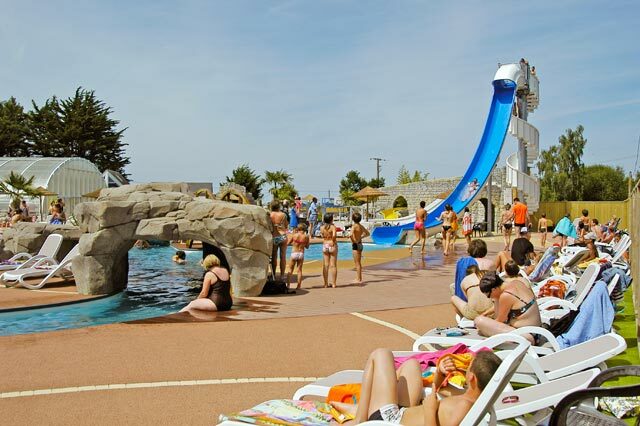 Offered in free access, let yourself rock to the rhythm of water jets with the backdrop of the remarkable blue sky of Loire Atlantique. 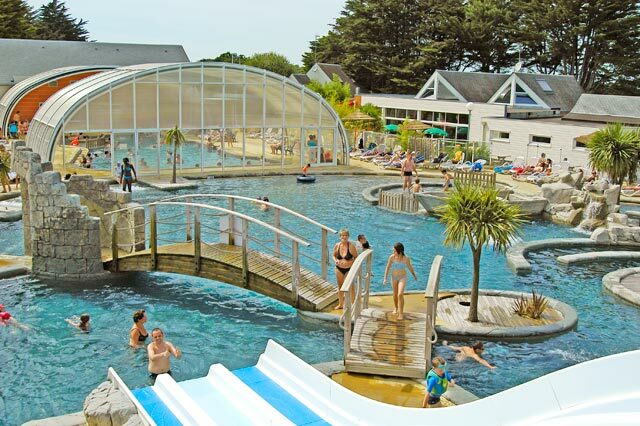 Everything has been thought out so that you can melt with happiness in your Guérande aquatic complex: A multitrack toboggan for several gliding sensations; Great Sensational Water Slides for the intrepid; A wide variety of free access water games such as geysers, slow river or whirlpools ; A true paddling pool suitable for young children , where toddlers marvel at the pleasures of water, under the watchful eye of parents. "I have never liked a campsite so much. 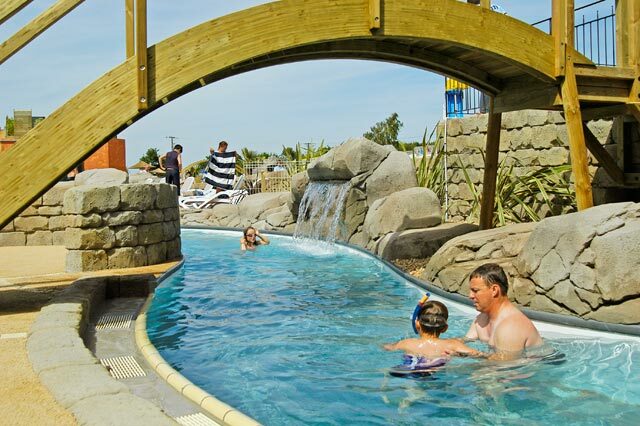 Great water space"
"A beautiful water area with an ideal water temperature and beautiful slides for all tastes"
Enter a aqua play area entirely dedicated to the pleasure of the little ones. Several animals including a giraffe, a lion and a squirrel walk in the realm of the imaginary. 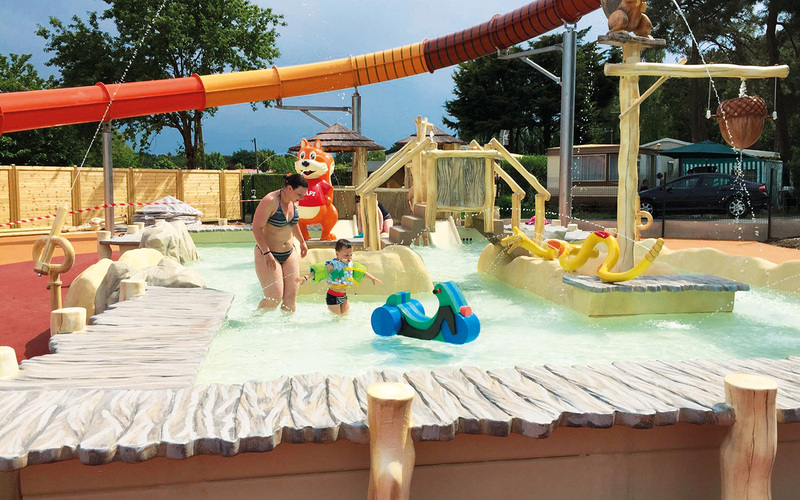 Fun jets, rotary seals and slides seduce adventurers through an aquatic safari, dominated by our mascot Capi, who kindly keeps an eye on the playground. But beware of stunned: the snake may well surprise you and water you! Too cold to venture into the Atlantic Ocean rolls? 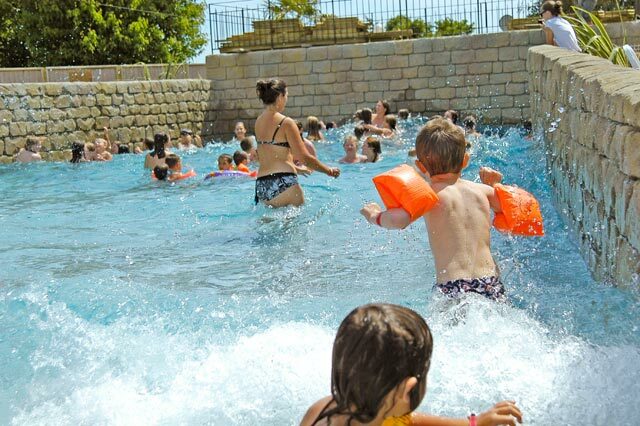 Do not panic, join the wave pool of the Camping Club Domaine de Léveno . 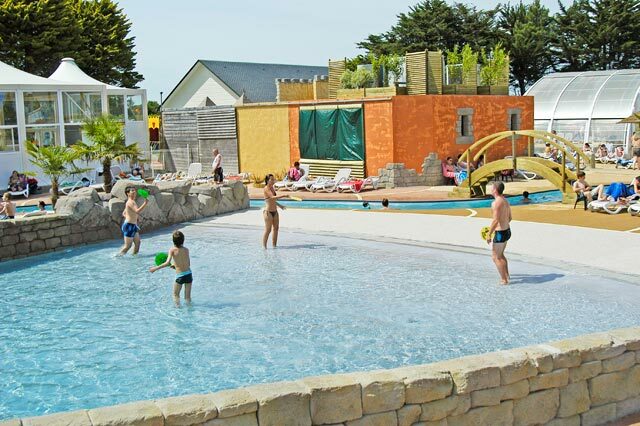 Immerse yourself in this fun and heated pool which is very popular with holidaymakers and face your first waves. You want to share a tender moment with your child at a young age, make him discover the sensations of the water without being surprised by the different users, join the paddling pool inside or outside dedicated to young parents, and watch your child grow up before your eyes. Moments of life that you will never forget. 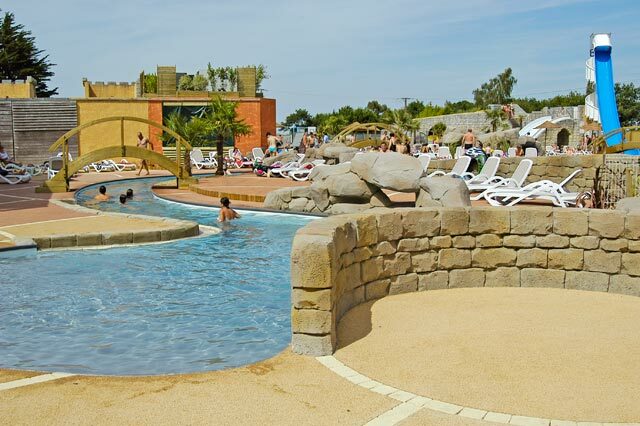 You have now understood, whether you are a lazy spirit or adventurer enthusiast thrills, the swimming pool complex of the field of Léveno meets all your desires. However, it is imperative to be cautious about the ponds and to ensure that safety instructions are followed. At the pool, your swimming and that of your children are under your responsibility. It is your responsibility to supervise your family and to respect the instructions in force. If some members of your tribe do not know how to swim yet or are learning, consider wearing armbands or buoys. Permanent monitoring and the presence of a responsible adult are essential when the aquatic area is open. 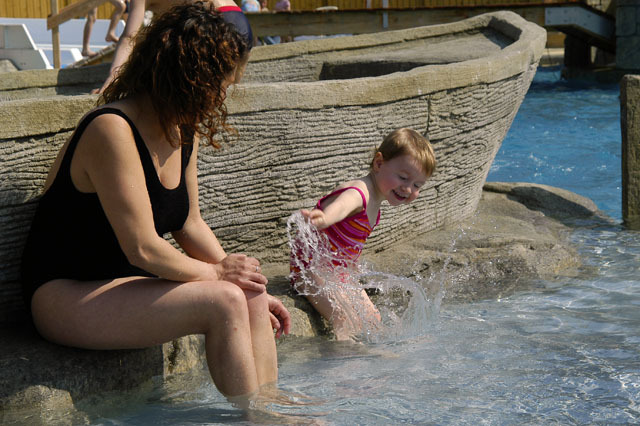 These recommendations are also applicable on wading pools where children must be accompanied. 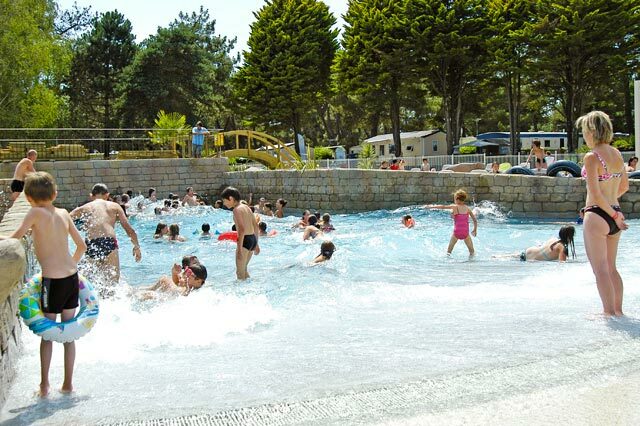 For reasons of hygiene and in accordance with the regional health agency, bathing shorts are not accepted to access bathing, also shoes are prohibited inside the l aquatic area. During the summer holidays, a team of pool wardens is there to enhance safety and prevent distractions. All the members of this one are graduates of the National Patent of Safety and Rescue Aquatic. A state-certified lifeguard occupies the position of basin manager during the July-August period. He graduated with a Professional Certificate of Youth, Popular Education and Sport, specializing in Aquatic and Nautical Activity. This diploma gives the qualifications required to offer swimming lessons to anyone wishing to learn how to move in the water. A certificate of aquatic comfort is issued at the end of the necessary sessions. All information is available from your reception service. 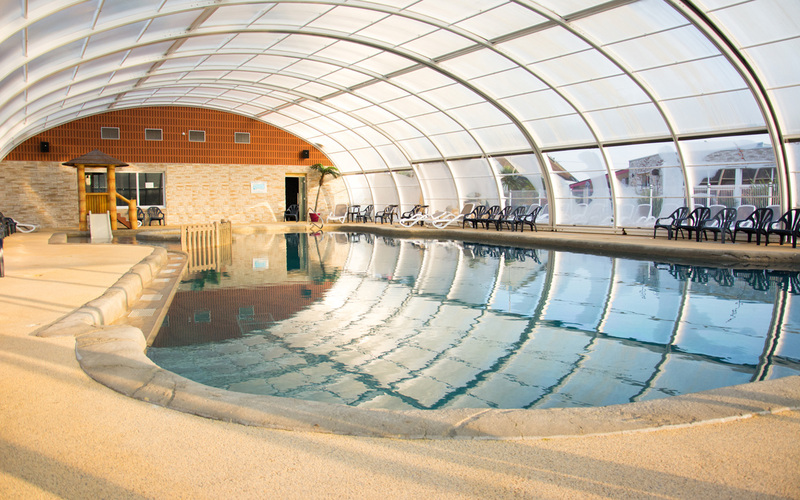 The indoor swimming pool is available from April to September . 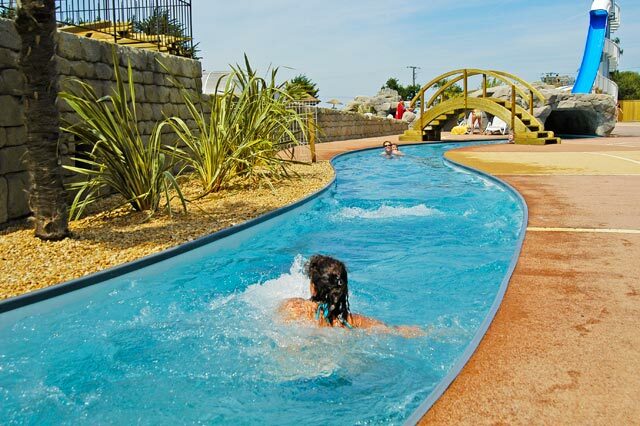 On the other hand, the water park with its paddling pool and its slides, its multitrack slides, its anatomical benches and its deckchairs are devolved to you from mid-May only. Sometimes these infrastructures are made available earlier in the season. To be informed, contact Cyprien reception service at 0033(2) 40 24 79 30, or by message directly by clicking on the drop-down tab located on the right of your screen.